Lung 7 is a very powerful point. 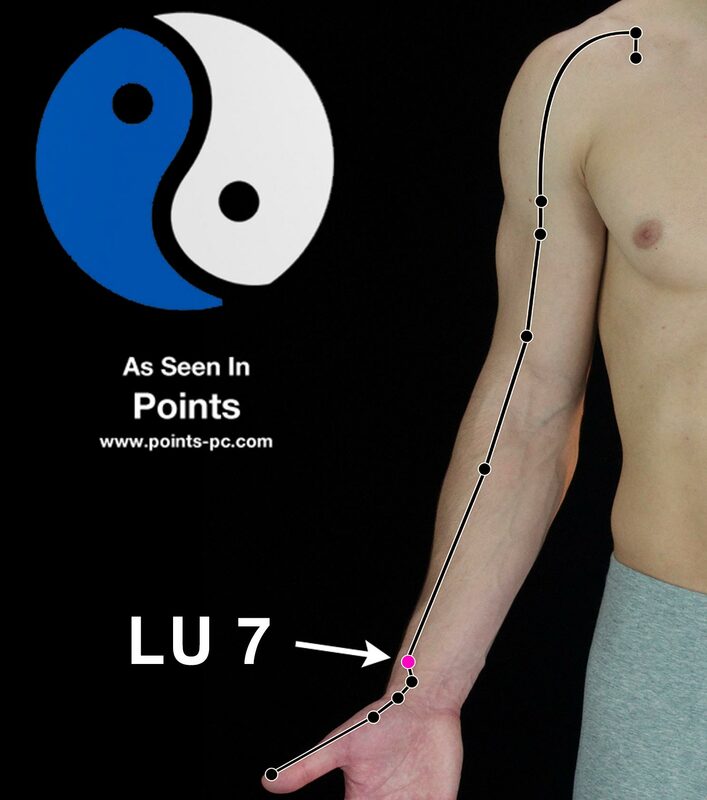 As the Luo point of the Lung channel, this point is used to treat anything related to the lungs—asthma, wheezing, bronchitis, cough, congestion, etc. The internal pathway of the lung channel passes through the throat, the lungs, the stomach, and the intestines so it is very good as a source for digestive issues, including constipation. Sadness and grief represent the emotions of the Lung. You’ve been around people who are grieving. They have a hard time taking a deep breath. From an esoteric point of view, this is representative of not having the strength to “breath life to the fullest”. Lung 7 is a great point for this person. Treatment of Lung 7 will help the lungs to receive more air, thus “breath easy” and have the strength to move on to new experiences. 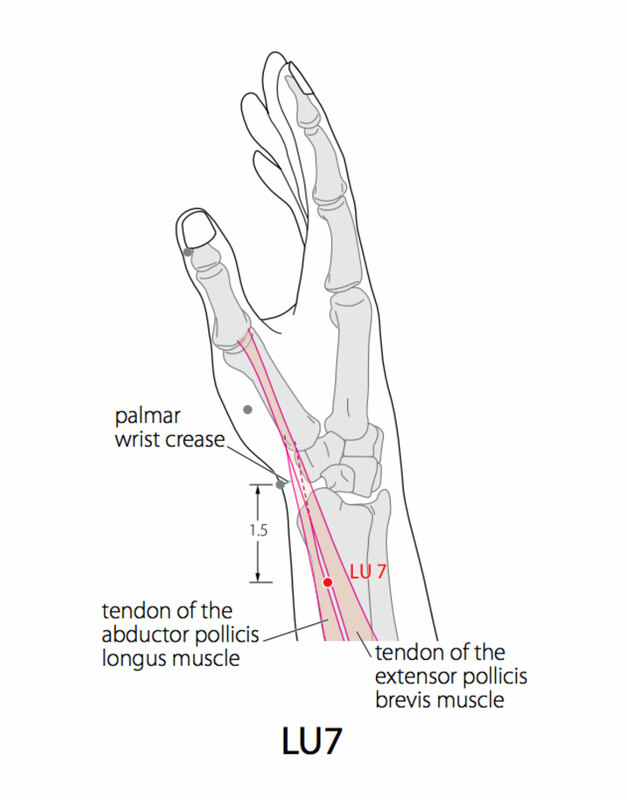 Location: 1.5 cun proximal to the most distal skin crease of the wrist, proximal to the styloid of the radius in a depression between the tendons of brachioradialis and abductor pollicis longus. Attributes: Luo point, Confluent point of the Conception vessel, Gao Wu Command point, Ma Dan-Yang Heavenly Star point, Five Star point. Command point for head and neck. Exit point. Command point of the Yin Heel vessel. Master point of the Conception vessel. TCM Actions: Diffuses the lung and dispels cold; courses the channels and frees the connecting vessels. Indications: Headache and stiffness of the neck; cough and asthma; sore throat; facial paralysis; wryness of the eyes and mouth; clenched jaws; weakness of the wrist. Secondary Indications: Headache; hemiplegia; enuresis and frequent voidings; pain in the arm and elbow; infantile fright epilepsy; penile pain; bloody urine; seminal loss; restless sleep; generalized wind bi numbness; fever and chills; tension in the chest and back; throat bi; heat in the palms; inversion counterflow in the limbs; toothache; malarial disease; heat and pain in the shoulder and back. Needle Information: Insert obliquely upwards .3 – .5 cun. Moxibustion is applicable.